Mariners still searching for a effective relievers to pitch the troublesome seventh inning. 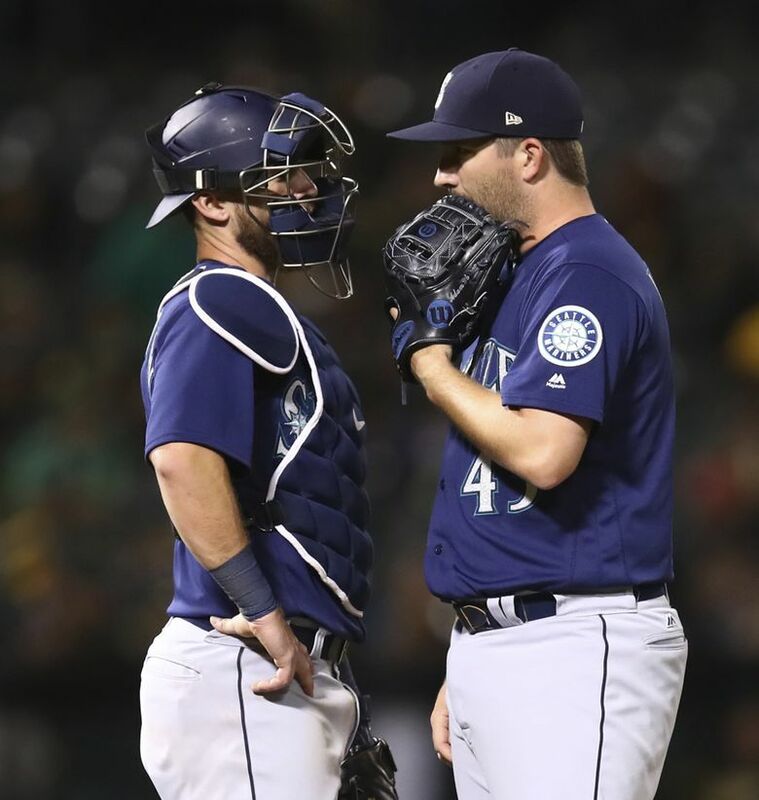 After the failures of Adam Warren and Zach Duke on Tuesday night, manager Scott Servais said they'll try other relievers in that role. Well, at least manager Scott Servais will have plenty of guys to choose from with the rosters now expanded. Following more seventh-inning failures from veteran middle relievers right-hander Adam Warren and lefty Zach Duke in Tuesday night’s 5-3 loss to the lowly Orioles, Servais admitted on Wednesday afternoon that he will be looking at other pitchers to fill that role of bridging the innings from the starting pitcher to set-up man Alex Colome in the eighth inning. Mariners’ relievers have posted a 5.19 ERA in the seventh inning of games. Only five teams — the Rockies (6.94), Rangers (6.19), Mets (5.58), Marlins (5.43) and Royals (5.40) have accumulated worse. A 20.6 strikeout percentage in that inning ranks near the bottom of MLB. Opponents’ slash line of .249/.322/.433 in the inning is more middling in terms of the rest of the league, but Seattle’s propensity for playing one and two-run games reduces the margin for error in that inning. Mariners general manager Jerry Dipoto acquired Warren and Duke along with right-hander Sam Tuivailala in three separate trades at the Major League Baseball trade deadline in an effort supplement the middle relief spots in his bullpen. He had Colome locked into the eighth inning spot and closer Edwin Diaz for the ninth. But trying to find a consistent producer in the seventh inning had not materialized. Both Juan Nicasio and Nick Vincent had dealt with injuries and ineffectiveness while James Pazos was working through command and mechanical issues at the time. Pazos had been one of Seattle’s most effective pitchers in that inning, throwing 17 2/3 innings and allowing just one earned run. But his velocity began to diminish in June and his command began to wander, forcing the Mariners away from him in that situation. The trades haven’t yielded expected results. Warren has a 5.54 ERA (eight earned runs, 13 innings pitched in 13 appearances with a 1.86 WHIP that includes 16 hits allowed. Opponents are posting a .296/.397/.500 slash line against him since joining Seattle. Duke was acquired to fill the role of Marc Rzepczynski, who pitched his way out of the organization in May. But Duke has given the Mariners similar production to Rzepczynski (9.39 ERA in 18 appearances), posting a 7.88 ERA (seven earned runs, eight innings pitched) with opponents — mostly left-handed hitters — posting a .300/.417/.567 slash line. In the seventh inning, Warren has made eight appearances, posting a 10.38 ERA (five earned runs, 4 1/3 innings pitched), while Duke has 10 appearances in the seventh and a 11.25 ERA (five earned runs, four innings pitched). Tuivailala, who had the best velocity and stuff of the trio, showed some promise and was trending toward that role for Seattle, but then suffered a season-ending injury in Texas. Servais lamented his loss. Ideally, he would have used Warren in the sixth inning and used some combo of Tuivailala and Vincent in the seventh. Even a healthy Nicasio might’ve been better suited for the role. While the big right-hander had an up-and-down season due to lingering knee issues that eventually required season-ending surgery, he could have been a better candidate in that role if healthy or if limited to not throwing on back-to-back days, which made the knee ache. Nicasio and Tuiviailala were power arms with strikeout capabilities. Servais credited Vincent with being much better over the last 10-12 outings, but admitted that he can’t have him do it alone. “You need multiple guys in that spot,” Servais said. So expect right-handers Shawn Armstrong, Chasen Bradford and Ryan Cook to get chances. If Pazos can harness his command, he’ll also get a look in the final month of the season. The Mariners announced a crowd of just 11,265 crowd at Safeco Field on Tuesday night. And that even that felt a little high looking around the park. Though all MLB teams go by tickets sold for a game, not actually people in the seats. It ranked as the ninth smallest crowd in Safeco Field history. It was the first time the Mariners announced a crowd under 12,000 since Sept. 9, 2014 when 10,347 showed up for a game vs. the Astros. Seattle’s recent slide in the wild card race and poor play is a factor in the small crowd along with their opponent. The Orioles are the worst team in baseball with 98 losses on the season and aren’t a huge draw. Also the day after Labor Day, usually the first day of school in the area, is a traditionally a poor draw. Here’s the attendance of the last five games in Seattle on the day after Labor Day. Before 2012, the Mariners were on the road for the day after Labor Day from 2005-2011. The Mariners moved past the 2 million fan mark on Monday and have drawn 2,012,298 fans this season and are averaging 29,593, which ranks 14th in baseball. They’re ahead of last season. After 68 games in 2017, they’d drawn 1,860,245 fans and were averaging 27,357 fans. Large crowds are expected for the weekend series with the Yankees in town. Though those games are usually a 50-50 split between Mariners and Yankees fans.